Adding rate high up to 70% !! PP-100 is Calcium Carbonate material compound with very few plastic carriers as its raw material, produced by new high-tech ultrafine mixed technology and has good dispersion, strong stability and non-toxic features. It has higher adding rate when used in PP OR PE injections, like charis, compared with other same Filler Masterbatch in the market. 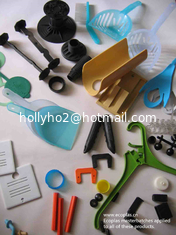 PP-100 can be widely used as a superior performance environmental friendly material to take place of a certain portion of plastic raw material for HDPE, PP, or PS plastic products, and won’t change the performances of the base material at the same time but largely reduce the material costs for the entire plastics production.